A few weeks ago I got a really fun email from Chelsea over at Pinterior Designer, asking if I would be interested in participating in a blogger challenge. Of course I said yes, and our first challenge is...patterns! Oh man. You guys...patterns aren't really my thing. 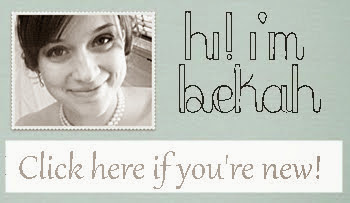 I love the way other people use them, but when I try I usually end up with a hot mess. I stewed on it for a few days, trying to think where I could best use a fun pattern in our house, which as a whole tends to be pretty neutral. Right around that time, the boys put a hole in the green curtain in their room. Well then...problem solved. Clearly the boys needed something new in there, and where better to experiment with pattern than in a fun kids room? I have always loved the look of bold striped curtains, but I've always been too cautious to give it a try. I had previously made them some little faux roman shades from drop cloths, so I wanted to continue that look, but I wanted these curtains to stand out, so I went with full length curtains. I bought one drop cloth for about $10, cut it to fit and hemmed the sides. Little tip: ALWAYS double fold your hem when you are working with drop cloth, this stuff sheds like you would not believe! String everywhere. I laid my drop cloths next to each other and measured my lines across both curtains at a time, that way even if my lines were a fraction of an inch off their measurements, the lines would be continuous no matter what. Just like painting any stripes, put your tape on the OUTSIDE of the lines that you want to paint. This will make your lines look unevenly spaced, but once the tape is removed the lines will be even again! If you need some pictures to guide you in stripe painting - here is a good one. After that is was a simple matter of painting. I used a stiff bristled paintbrush and dabbed the paint on, I found that that gave me much better coverage than trying to paint it on like you would on a wall. It sort of pushed the paint into the fabric. Over all, I am loving it! It definitely lends the room a 'big kid' vibe, which is an adjustment - but in a good way. 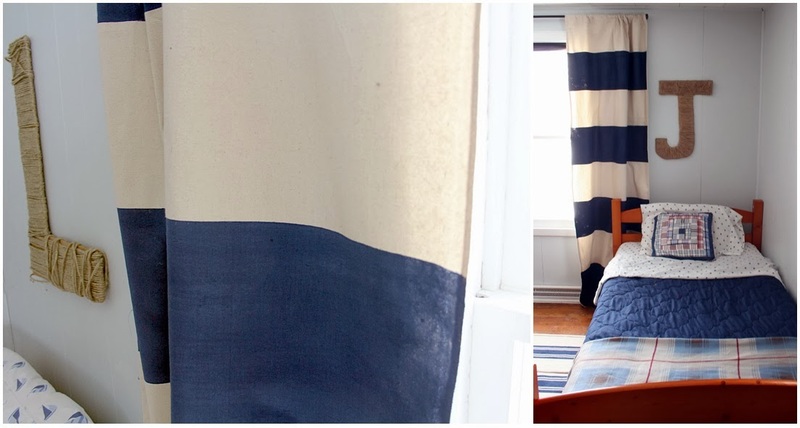 The navy blue and the drop cloth also add to the nautical feel we have going in there, without being over the top. There is definitely some variation in the painted stripes, especially when the sun comes through, which you can see in the above left picture, but I actually like that. I feel like a little bit of the imperfect can add a lot to a room. Yeeaaaaah! I am loving the changes! I think with my personality our house will always be changing, so I can't say any room is ever 'done' but for now, this one is looking much better to me! I am so glad I decided to be a part of this challenge, because without the push to try pattern on a larger scale I really doubt I would have given this a try. Thanks Chelsea! You guys should definitely hop over and check out all of the other participants in the Pattern Challenge! That picture of Jack is too funny :) I can't believe the difference in the before and after! You guys have put a ton of work into your house. Love the stripes and you're right, it definitely adds to the nautical feel of the room. Amazing job! Thanks Chelsea! I loved being part of the challenge - its been super fun to see what everyone came up with! I'm obsessed with the nice big stripes :) Love them! This looks terrific! I have been wanting to try this for a while, and you have motivated me to go for it! Love looking at all your before and after pictures! You have done an amazing job on your entire house! LOVE the stripes! It's definitely more of a big boy room now. I am totally on board with a bold striped curtain..looks fantastic!! And wow, what a transformation that room has undergone..great job!! Love those bold stripes! They are perfect for the boys room! I would have never known that these were painted! They look great in the room. I have a couple ideas for painted curtains, myself, but I'm scared to take the plunge!